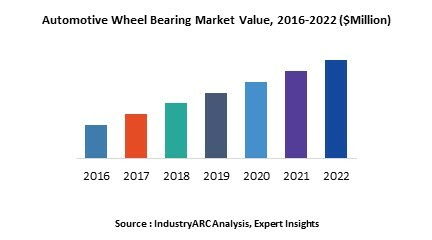 Automotive Wheel Bearing Market is anticipated to grow with a CAGR of 5.52% from the year 2018 to 2025. APAC is having the highest market share in the year 2017 followed by Europe and North America as the second and third largest market for the automotive wheel bearing market. What is Automotive Wheel Bearing Market? Automotive wheel bearing are vital machine components designed to allow the wheel to spin properly. Wheel bearings is a set of steel balls held together by a metal ring which is called a race. Automotive wheel bearing rides on metal axle shafts and fits tightly inside the hub which is a hallow chunk of metal at the center of the wheel. The hub holds the lug bolts that are used to bolt the tire onto the wheel. The wheel bearing is pressed into the hub from the back. Timken which is a leading company in wheel bearing has acquired ABC Bearing Company. This acquisition will help Timken in expanding their portfolio and the presence of the company in many different areas. Schaeffler India has announced merger with INA Bearings and LuK India. The key objective of this merger is to combine the strengths and competencies of all three Schaeffler entities and establish one strong listed Schaeffler entity. Who are the Major Players in Automotive Wheel Bearing Market? The companies referred in the market research report includes Timken Company, Svenska Kullagerfabriken AB, Schaeffler AG., Jtekt Corporation, NTN Corporation, Iljin Bearing Co., Ltd., ORS Bearings, CW Bearing, C&U Bearing and more than 10 other companies. 15.7. Iljin Bearing Co Ltd.